Make these Cheesy Volcano Meatballs for a dish the kids will love! These flavorful volcano meatballs feature melted cheese 'erupting' from the tops. Mix meat, cracker crumbs, Parmesan and 1/4 cup pasta sauce just until blended. Shape into 12 balls, using about 2 Tbsp. meat mixture for each. Place, 2 inches apart, in shallow pan sprayed with cooking spray. Press 1 cheese cube deeply into center of each meatball. Bake 14 min. or until meatballs are done (160ºF). Microwave remaining sauce in microwaveable bowl on HIGH 30 sec. or until heated through. 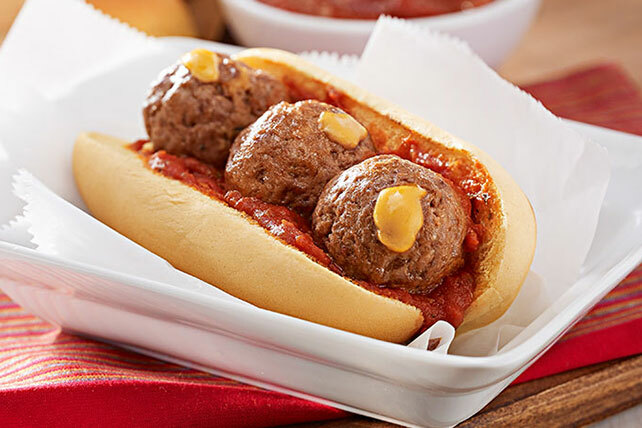 Fill buns with meatballs and sauce just before serving. Cut 12 (1/2-inch) cubes from a block of KRAFT Cheddar Cheese to use instead of the KRAFT Cheese Cubes. Omit buns. Serve meatballs and sauce over your favorite hot cooked pasta. Prepare with extra-lean ground beef, RITZ Reduced Fat Crackers, KRAFT Reduced Fat Parmesan Style Grated Topping and KRAFT Colby & Monterey Jack Cheese Cubes.